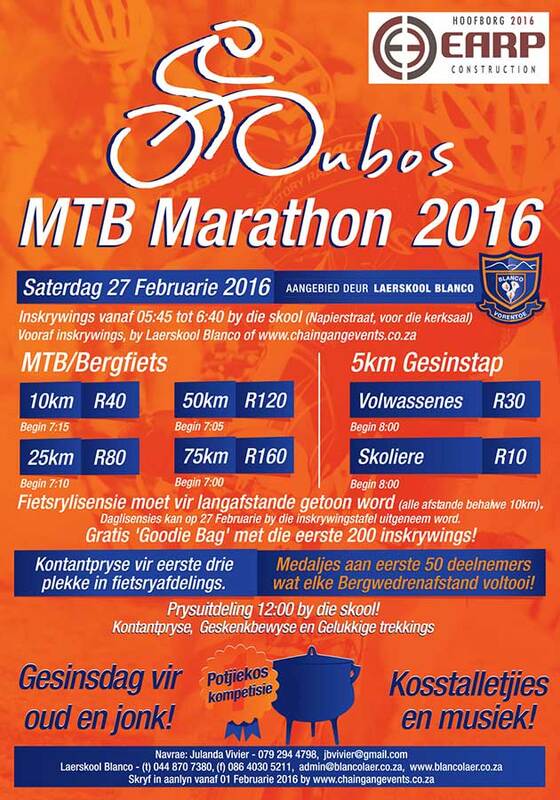 Blanco Primary School, up the road from Fancourt is the place to be on Saturday the 27th of February 2016. The date for the race is 27 February 2016. No refund for this event. CSA licenses have to be shown at registration for the 25, 50 & 75km distances. If no licence a temporary licence has to be purchased at R35. NO helmet = NO cycle! Prize Giving: 12:00 on the school grounds. Cash prizes for 1st, 2nd and 3rd in each category. Please come and enjoy the day afterwards with Blanco Primary School with Food Stalls and music available. There will also be a “Potjiekos” competition, so pack those 3-legged pots as well as the bike!